Carrot Juice is definitely a healthy drink and extracting fresh juice out of fresh carrots has lots of nutrition and quite a lot of health benefits. 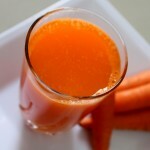 Carrot Juice is packed with many benefits and is a wonder drink for any age. Other interesting drinks or juices to be tried are aam panna or aam ka panna, apple juice, badam milkshake, masala chaas, chikoo milkshake, phirni, ragi malt, sweet lassi, lassi punjabi style, pineapple juice. Eating plain carrots can be quite boring but using them in the form of a juice or a milkshake gives an interesting feel and a good way to finish of the carrots. Carrots can be eaten in different ways like they can be eaten raw or they can be eaten as a vegetable curry, salad and there are many varieties that can tried with this healthy vegetable. Carrot at home is used to stir fry and eat as a side dish and is also used along with various combinations with other vegetables. Carrot juices, milkshakes, smoothies and many more recipes are made with this good looking vegetable. All these juices and mainly carrot juice for kids works wonders for their eyes and keeps them fit and filling. 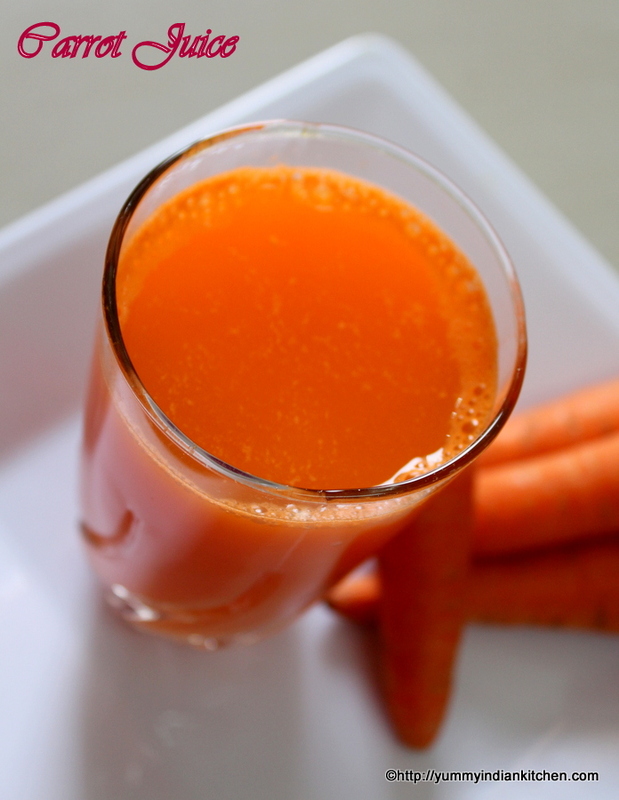 This carrot juice recipe is very simple and also takes very less time. It is good to include carrot juice early mornings or atleast once in a while. Drinking healthy drinks cleanses the body and flushes the toxins out from our body. We all are familiar with the health benefits of carrots like they are good for improving our vision, they strengthen our immune system, prevents from heart diseases, prevents cancer, it also works wonders for our skin and keeps our skin glowing and gives youthful freshness to our skin. Carrots and beetroots are wonder vegetables and should be included and made in various ways like I have posted another juice recipe with beetroot that is beetroot juice and should always be tried to use them in different forms and no way these can be a boring vegetables if eaten, made and tried in unique ways. I shall be glad to include various carrot recipes along with time as I keep updating my blog. 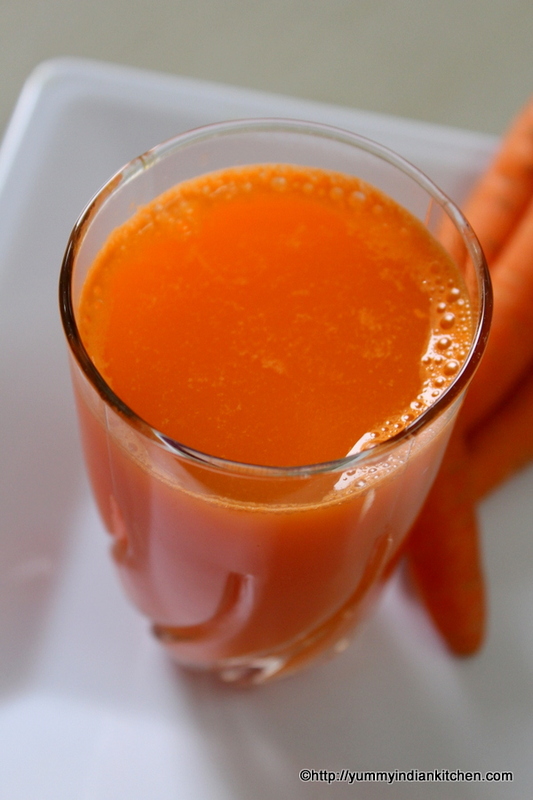 Let us get into the details of making this quick carrot juice recipe. Firstly, wash the carrots and peel the carrots with the help of a peeler and chop them into pieces. In a blender or a juice extractor, add the chopped carrot slices. Add sugar and add chilled water into the blender. Blend it into a smooth juice for 2-3 minutes. Strain the juice completely by mashing the pulp as much as possible and discard the pulp. Add lemon drops into it and stir well. 1.Here I have added lemon juice in the end but it can also be replaced with some orange juice that can be mixed with carrot juice. 2.Mixing lemon juice or orange juice with carrot juice gives a very good taste to the plain juice. 3.The quantity of sugar can be increased or reduced as per requirement. 4.Other fruit flavors like apple juice too can be added. What a healthy drink or juice this would be and it sounds quite tasty too. Thanks for sharing on Real Food Fridays. Pinned & tweeted! Hi, Can I use brown sugar / nattu sakkarai instead of white sugar?